2006, 210 S., 22,5x15cm, br. 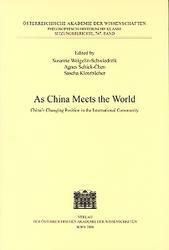 "As China Meets the World" is a selection of papers that were presented at an international conference held in Vienna in 2004 under the same title. Aiming at a better understanding of China's emergence as one of the world powers of tomorrow, as well as addressing issues such as the Taiwan crisis and China-EU diplomacy, the anthology traces China's encounters with the international community, its institutions and legal foundations during the 20th century. The volume focuses on China's integration into and cooperation with international organizations, including the League of Nations and the UN. This examination, especially in view of its historical dimension, has revealed that internal developments in China cannot be understood without taking external factors into consideration. Still, the contributors to this volume, from both China and the West, go one important step further in their evaluation of recent developments and the present situation. They state that the outside world has not only been a challenge to China's transformation process, but that China is also a challenge to the world.